No, I’m not insulting anybody. I simply went out with two friends to see a production of Green Day’s American Idiot: The Musical. Of the three of us, I was the biggest fan, in that I actually own the entire original album, not just the hit songs from it. But I don’t know it that well. Like, I only know the lyrics to the hit songs from it, and I’ve never taken the time to try to figure out what the plot or concept behind it actually is—though it appeared to have something to do with a young man’s angst. So we were all going in blind, not knowing what the story or characters would be. There’s no orchestra with this; it’s truly a rock musical, to the point where the guitarists, bassist, keyboardist, and drummer are actually up on stage, in the open, with the actors, through the whole production. The cast also sometimes joins in on guitar (on a couple tunes Johnny sings with himself as accompaniment on acoustic), and their voices—oh my God! What amazing singers. (Somewhat better than Green Day’s Billie Joe Armstrong, I would say.) But they have voices suited to rock, not Broadway, if you know what I mean. It was a super energetic production, 110 minutes, no intermission. The dancing features a lot of head thrashing, fist pumping, and running and jumping. The staging was industrial-looking, featuring a lot of TVs that helped propel the mood of the story, with occasional strobe lighting and glitter. So I’m going to go out on a limb and say that if you aren’t a fan of guitar-heavy, potty-mouthed, angry /angsty rock music, this is not the musical for you. But we quite enjoyed it. Though it has to be said [do I have to give spoiler alerts on a musical? ], the ending is not of the triumphant, feel-good sort. Love does not conquer all. Dreams are not realized. The world is not a better place at the end than it was at the start. I thought that was brave, but also couldn’t help wishing it could end on a bit of a happier note. 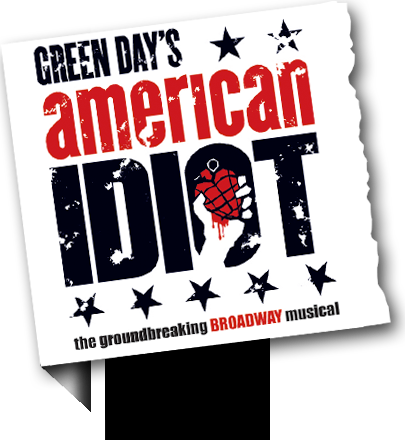 Which is why the cast encore was so brilliant, and perfect, and not really cheating at all: Green Day’s “Good Riddance (The Time of Your Life)”. I hope you had the time of your life! Categories: Arts, Music | Tags: albums, Canadian arts, live music, songs | Permalink. You captured last evening’s experience perfectly Cathy. Now if only I could figure why sometimes the embedded videos show up in the email version of this, and sometimes they don’t….